Biochemical Oxygen Demand (BOD), also often referred to as biological oxygen demand, is a test performed to measure the potential of wastewater and other waters to deplete the oxygen level of receiving waters. In other words, the BOD test is performed to determine what effect dirty water, containing bacteria and organic materials, will have on animal and plant life when released into a stream or lake. What is the difference between BOD and COD? BOD (Biochemical Oxygen Demand), also often referred to as biological oxygen demand, is a test performed to measure the potential of wastewater and other waters to deplete the oxygen level of receiving waters. The BOD test involves taking an initial dissolved oxygen (DO) reading and a second reading after five days of incubation at 20°C. For this reason, this test is often written as BOD5 for short. COD (Chemical Oxygen Demand) analysis is a measurement of the oxygen-depletion capacity of a water sample contaminated with organic waste matter. Specifically, it measures the equivalent amount of oxygen required to chemically oxidize organic compounds in water. The most common COD method is the wet chemistry method, dichromate COD (CODCr). This involves a two hour digestion at high heat under acidic conditions and involves hazardous chemicals such as mercury and dichromate. MANTECH has developed an automated COD method utilizing a new, rapid and green technology called the PeCOD® COD Analyzer. This method directly measures the amount of oxidizable material in a sample via photoelectrochemical oxidation in a microcell, eliminating the need for time-consuming digestion and hazardous chemicals as only an electrolyte solution is required for analysis. TOC (Total Organic Carbon) is the amount of carbon based organic contaminants in a water system. TOC does not identify each specific organic contaminant present, but rather an absolute quantity of all carbon-bearing molecules. In other words, TOC is a way to measure organic contaminants that may pose a threat to drinking water or wastewater systems. 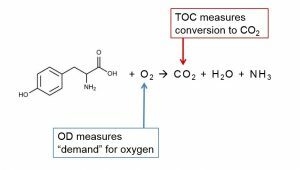 What is OD (Oxygen Demand)? 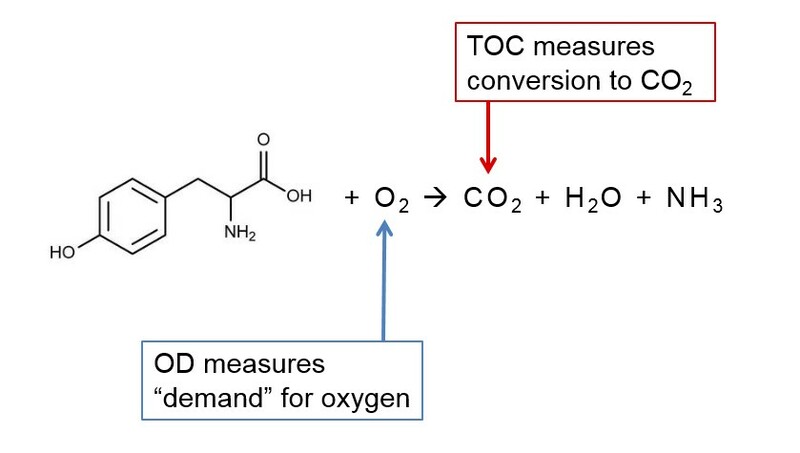 OD (Oxygen Demand) measures the chemical reactivity of organics by the demand for oxygen, as shown in the diagram below. It can be used as an additional tool in the characterization of NOM (Natural Organic Matter) to predict DBP (Disinfection by-product) formation. This metric also allows for rapid feedback and optimization of coagulation and disinfection dose requirements. Turbidity measures the relative clarity of a water sample. It is determined by the amount of scattering that occurs when a light source is shined through a water sample. Read the full answer here. THMs (Trihalomethanes) are disinfection by-products (DBP’s) formed when residual chlorine reacts with elevated levels of naturally occurring organic matter found in water. THMs are present in most drinking water supplies and are dependent on several factors such as type of organic material present and chlorine dosage. UV254 is a water quality test which uses ultraviolet light of 254nm wavelength to measure natural organic matter in water and wastewater. What is Natural Organic Matter? Natural organic matter (NOM) is a critical target for drinking water treatment because it causes a negative effect on water quality by colour, taste and odor, and can react with disinfectants to form Disinfection by-products (DBP). There are several tools for measuring NOM in source and ground water that include TOC, DOC, BDOC, UV254, SUVA, and Oxygen Demand (OD). Conductivity is used to measure the concentration of dissolved solids which have been ionized in a polar solution such as water.